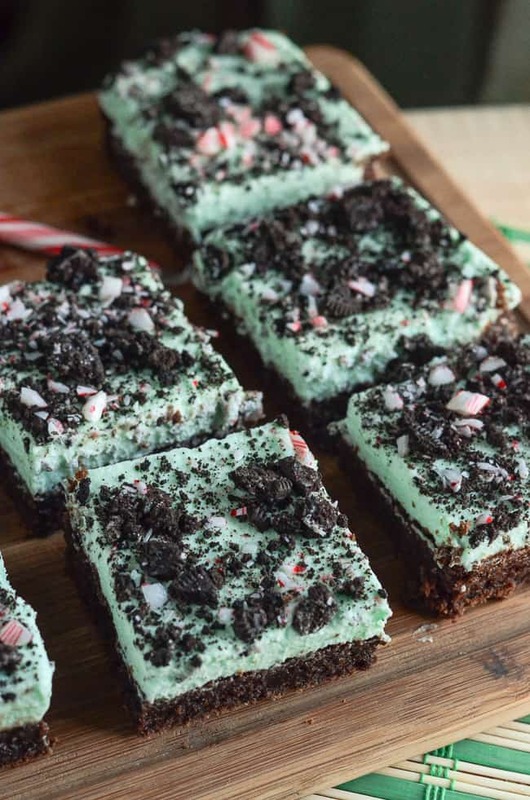 Moist and fudgy dark chocolate brownies, topped with a minty, fluffy cloud of mousse and studded with cookie crumbles (naughty) & candy canes (nice)! I will be the first to admit how much I love fall and spice and everything pumpkin flavored…but I think it’s safe to declare pumpkin season over and usher in peppermint season! Which I am equally in love with. I can trade my pumpkin spice in for peppermint mocha with only a twinge of sadness. After all, it will be back in 9 months! Maybe 8, if Starbucks keeps pushing it. We may have PSL available by the end of July. 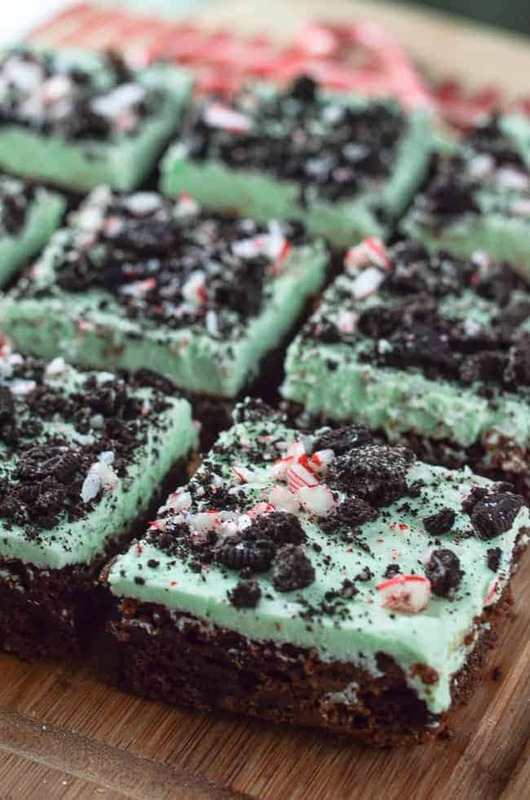 Anyhoo, in honor of December, all things cold, and the impending jingle bells, I’d like to introduce you to a tasty incarnation of one of my favorite flavor combinations of all time – these Naughty & Nice Mint Mousse Brownies! It all starts with the brownie, folks, and these brownies? To. Die. For. They are mind-blowingly fudgy. I made them three days before I actually made the finished products, and had them sitting in the plastic-wrapped pan with a slice of bread to keep them moist. I was hesitant to use them, afraid that they would have dried out and not had the look I was going for. They turned out absolutely perfect, and the espresso powder married with the dark cocoa powder made them so intensely chocolatey! I can’t wait to make them again so I can try them solo. Though it will be hard to imagine a better combination than these with the terrifically light and fluffy mint mousse that sits on top of them! They’re seriously scrumptious. All things chocolate and chewy and wintry and wonderful. Imagine, if you will, a cold winter day. You’re inside your cozy house, fire crackling on the hearth, all wrapped up in a fuzzy blanket, staring out the big picture window at the snow gently falling to the ground. A loved one brings you a plate of these brownies. You smile graciously, and with one bite, you’re simultaneously inside as well as outside; cuddling up and making snow angels, warming your hands while throwing a snowball. It’s a little bit of Christmas magic! Or…you’re arguing over who gets the last one. To each his own! Preheat oven to 350 degrees F. Spray an 8×8-inch baking dish with nonstick cooking spray, then line with parchment paper, leaving some overhang on opposite sides to act as handles. Spray parchment lightly with cooking spray and set aside. In a medium bowl, whisk together flour, cocoa, espresso powder, baking powder, and salt. Set aside. In a large bowl, with an electric hand mixer (or stand mixer fitted with a whip), beat together eggs and sugar for 4 minutes. Add in oil and vanilla and mix until well blended. On low speed, gradually add in dry ingredients until combined. Pour batter evenly into baking pan. Bake for 30-40 minutes, until a toothpick inserted in the center comes out clean and edges of brownie have slightly pulled away from the sides. Allow brownies to cool completely before continuing. In a small bowl, dissolve gelatin into cold water and let sit for 5 minutes. Place white chocolate in a medium bowl. Set aside. Warm 1/3 cup of heavy cream in a small saucepan until steaming. Whisk in softened gelatin, peppermint extract, food coloring, and salt until dissolved. Pour warmed cream over white chocolate and let sit for 30 seconds; gently whisk until smooth. Place 2/3 cup heavy cream and sugar in a large cold bowl, and whip on medium-high speed until soft peaks form. With a rubber spatula, fold half of the whipped cream into the chocolate mixture. When lightened, fold in the remaining cream until color is uniform. Working quickly, spread mousse on top of the cooled brownies, smoothing it into a thick, even layer. Cover with plastic wrap and refrigerate until set, 2 hours – overnight. 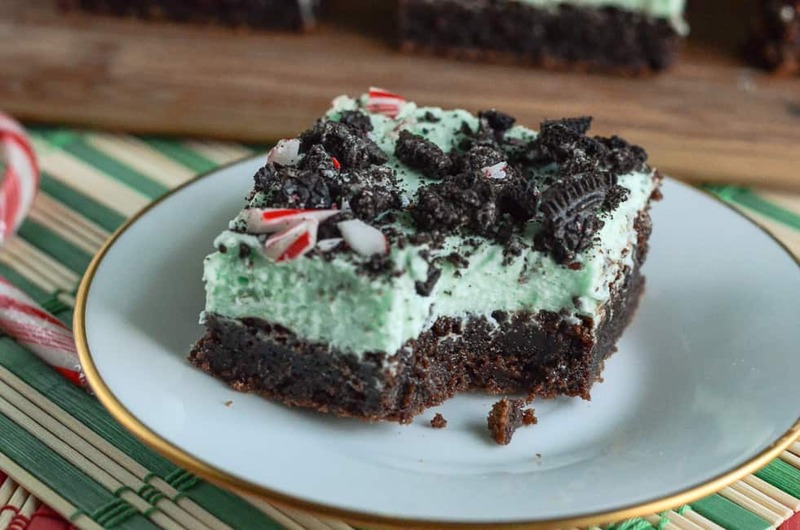 Top the finished brownies with crushed Oreo cookies and candy candy pieces if desired and serve! How do you like to top your brownies? I tell you, ever since I discovered what espresso powder is, I use it in everything chocolate that I make! It’s great! These pictures are making my mouth water! I am actually drooling over these so have pinned for later. Visiting from Hump Day Happenings. That is so very true. It’s one of those times you wish you could reach through the screen and grab what you’re drooling over! OMG these look absolutely delicious. I would have them with a strong cup of coffee and lots of great conversation. They are wonderfully presented as well. They would be great with coffee! But I’m a coffee-holic, so…:) Thank you, Reginia! I love the name of these brownies. So cute. My kids would love this because they love mint. 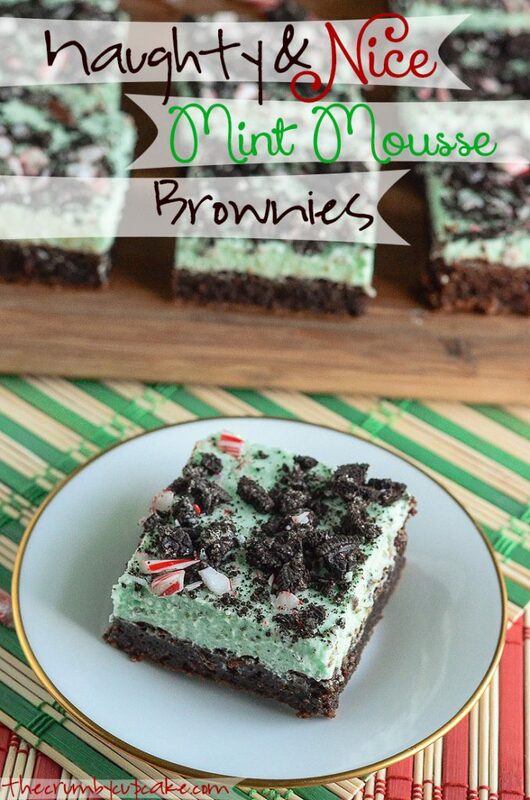 It seemed like a fitting name, because chocolate is so decadent and mint is so light! Thanks for stopping by! Nom, nom! I WANT these NOW! They look oh so good! Those look SO GOOD!!! Thank you for sharing the recipe! As usual your pictures are fantastic! Loving how perfect they turned out. Thank you, Aimee! <3 They could have been more perfect – cutting brownies delicately is hard! WOW! These looks absolutely heavenly! I wonder if there are any calories? LOL! I’d still have a few…in moderation, of course! Hahaha, holiday calories don’t count! These look amazing! 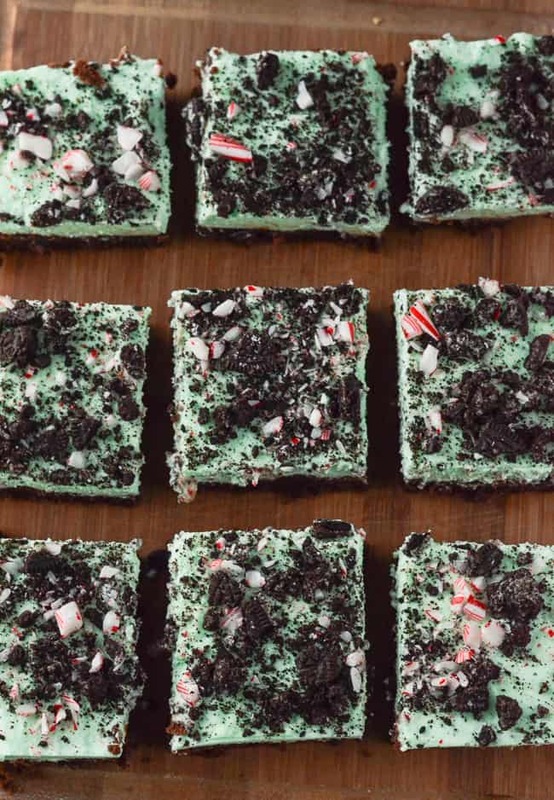 I’m not a huge fan of peppermint of chocolate mint, but these look too scrummy to be denied. 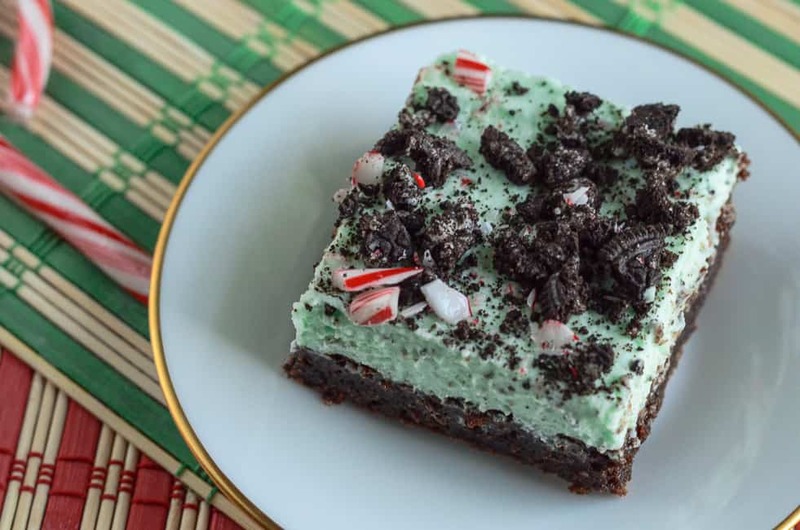 And if I decided to leave the mint out and threw on a gummy worm, it could essentially be dirt cake brownies which would also be fantastic. Great post and great recipe! You could totally make an Oreo or chocolate mousse instead of mint and they would be just as yummy! I love the idea of dirt brownies, actually! So cute! OMG i want to make these SO bad my stomach hurts. Like YUM! These look delicious! I’ve pinned this recipe to try this holiday season! It also makes the perfect hostess gift! So yummy looking I can almost taste them! I’m sorry, I have to go. I’m making these ASAP! holy heck these look good. Mint is my favorite flavor year round! I just LOVE the combination of mint and chocolate! These brownies look absolutely sinful. 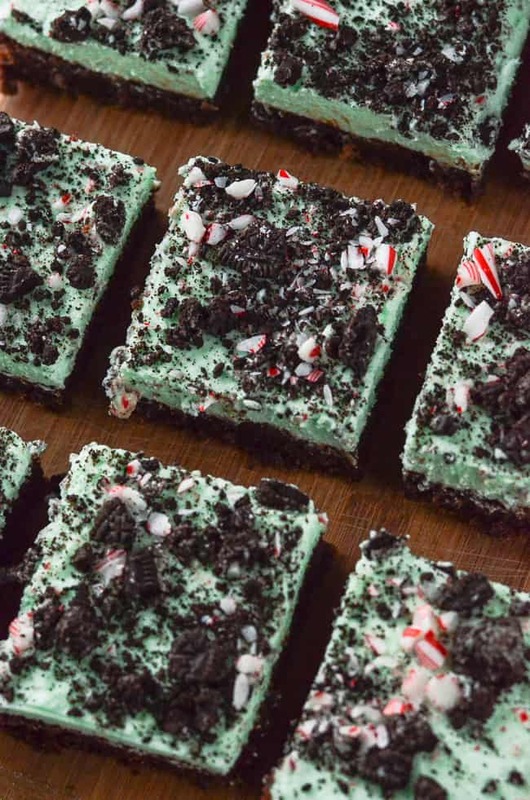 They are definitely on my list of treats to make this season. Thanks for sharing them with Hump Day Happenings! Well now I know what I’m making when I get back to having a kitchen!!! So excited for mint and Christmas fun! I just made a double batch of these, split between 2 pans. I haven’t tasted the final product yet, as I’m taking them to our neighbors for game night (tonight). I have a question though, the edges of my brownies were quite done, while the center was barely done, and when I brought them out, the center sank and the edges are still raised. Did I do something wrong? To put the mousse on across the entire pan, it would be super thick in the middle and barely any on the edges, so I left the edges without. Any idea what happened? Also, I really like the idea of the parchment paper to lift out of the pan, especially since we’re taking them to a party…no need to leave the pan. Besides all that… I can’t wait to try them! We’re using the green mint oreos!!! Hi Kari! I’m so sorry you’re having problems! I made a double batch myself a couple days before Christmas and thought it would be OK to do them in a 13×9 pan…wrong. They ended up tasting delicious, but I also had the issue with the mousse being thicker on the middle pieces. Did you split the batter between two 8×8 metal pans? The batter is very very thick and puffs very nicely, so your best bet would be to maybe use a 9×9 pan (metal, not glass) or possibly lower the baking temp 25-50 degrees if your oven bakes hot. They’ll take longer to bake, but they should come out more evenly. I hope they are a hit tonight! 🙂 Good call on the mint Oreos!!! These look ah-mazing!! I love brownies. I can’t wait to try this!